One of Europe's largest airlines is under fire for its latest ad campaign after critics on Twitter have called it borderline "racist". Air France's "France Is In The Air" ad campaign currently features 18 visuals, highlighting some of the airline's new developments but also some of the destinations the carrier travels to. The airline says the visuals "create an effect of surprise by mixing heritage and modernity, while echoing Air France’s past as a renowned poster specialist. Pleasure, youth and vitality emerge from images of the Moulin Rouge, the French Revolution, the Sun King, master chefs and haute couture," according to the Air France's press release. The airline adds that the campaign will air in 12 countries, including Canada. Some of the images showcase mostly Caucasian women modelling in attire that tries to capture the culture of destinations the airline serves. For locations like Paris and Italy, the women are fairly nondescript, but destinations like Tokyo, Beijing and Dakar have white women with wild eye makeup, headdresses and modified costumes. The ads caught the attention of Asian-American activist, Jenn Fang, who says the ads "fetishistically Orientalist". 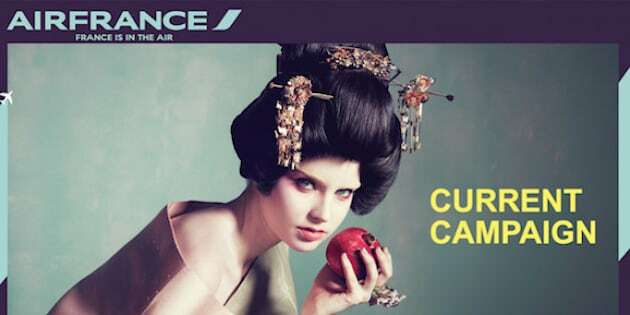 "To sell Air France to my people, you show me a picture of a woman wearing yellowface makeup to mimic the shape of my Asiatic eye, and looking fiercely off-camera as she triumphantly mounts the mutilated carcass of my Chinese culture on her head like a gruesome, blood-soaked trophy." The ads also sparked a parody on Twitter, after Wall Street Journal columnist Jeff Yang uploaded a Photoshop document of the ad on Twitter for users to release their own versions of the ad, using the hashtag #FixedIt4UAF. This isn't the first time customers have accused an airline of racism. Earlier this year, All Nippon Airways aired an ad featuring one of its pilots dressed in whiteface. The Japanese airline was forced to apologize and pull the TV spot after customers found it offensive to Westerners.